Kgalagadi (Pronounced Ga’laga’di) is the Tswana name for the wilderness, which falls within the borders of South Africa, Botswana, and Namibia. It is the hunting ground of the nomadic Bushmen and the home of the several Tswana tribes who call themselves Bakgalagadi (people of the wilderness). The author collected the stories during her years as a safari guide in Botswana. In retelling these stories of the Bushmen the author has retained, as far as possible, the essence of the original. They are simple, totally free from abstractions – truly primitive art. The stories are told in the style and spirit of the Bushmen. This explains the short, clipped sentences, the virtual absence of adjectives, adverbs pronouns, conjunctions and subordinate classes. Animism (where non-human entities display human traits) pervades: Moon is a venerated deity, Rain, a long-legged animal that treks from one place to the next; and Hail, a human being. In their practical form and their animistic conceptions, these tales stand out uniquely in literature, as do their graphic art counterparts, the rock paintings of the Bushmen. These indigenous tales have been recorded and published to ensure that, like the folk tales and fables of Europe, they are not lost to generations to come. 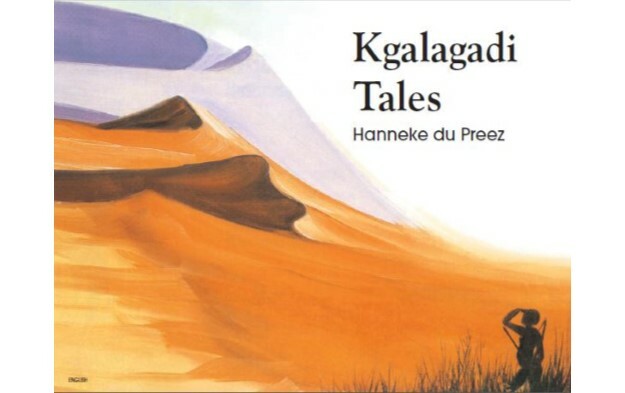 Thanks to the funding granted by the National Lotteries Commission, Biblionef commissioned the publication of a very special children’s book titled Kgalagadi Tales. On the 26th May 2016, we had the privilege of launching this wonderful book!